Happy Friday! I can't believe it's already time for the weekend again, this week (and spring break!) has flown by insanely fast. I'm sad that my break is coming to an end, but I'm also really excited for my classes next quarter! I've enjoyed my time with my puppies and kitties - I can never get enough - and I will definitely miss them when I go back to school. It's been nice just being able to relax and not worry about school and work! 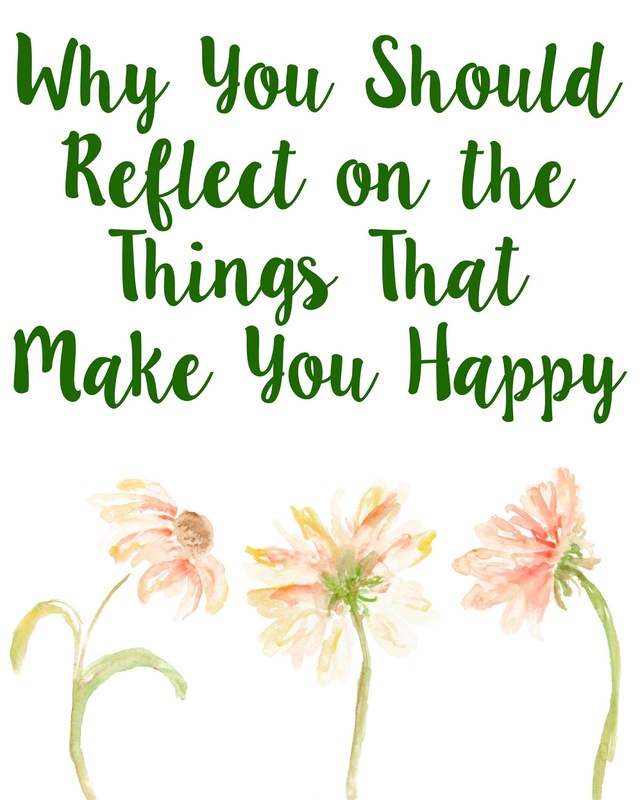 Today I wanted to talk about something that's super important: reflecting back on what makes us happy. I was really inspired to talk about this by Renee from Lose the Road (seriously, go check out her blog - she's one of my favorite bloggers! ), because she posts about what made her happy throughout the week. This is such an awesome way to think back on the things that made you feel joy, rather than focus on all of the negative things that happened throughout the week. Scientifically, it is in our nature to focus on the negatives parts of life since those occurrences pose the most danger, so it's really important to combat those thoughts with happy memories. I fall victim to focusing on the negatives very easily since I worry about things so often. It's extremely difficult for me to turn off my brain sometimes, and I just end up going over bad occurrences over and over and over to try and see if there was anything differently I could've done in order to change the outcome. I know so many other people struggle with this as well, and it really can be the worst. It's hard to stop worrying about something, especially when it affected you in a negative way. This, however, causes so much unneccesary stress, because there is literally nothing you can do to change the past; it is physically impossible (unless, you know, you believe in time travel and wibbly wobbly timey wimey stuff). Even though it's easy for me to get caught up in the anxiety of negative memories, I try to be an optimist. My brother is very much a pessimist, so when I was younger I tried to be the one who looked at the brighter sides of things. Being an optimist isn't always easy, or doesn't always come naturally, so thinking about what made us happy throughout the week is a great way to start seeing things in a different light. When you reflect back on positive memories rather than negative ones, life really does seem more happy, and optimism comes more easily. Thinking about what made us happy also allows us to be more grateful for those things, and not take them for granted. It puts life in perspective, and helps us understand that there will be ups and downs in life that are most often out of our control. And while it is important to learn from your mistakes and unhappy events, it is unnecessary to focus on them incessantly. Learning from something and not being able to let it go are two different things - I've been there before, and let me tell you it is not healthy. Sometimes it's best to let things go when they are only making you stress out, and aren't offering you anything but negative side effects. It took me a long to understand this, and I still struggle with it. I still focus on things that didn't have the best outcome, and go over them again and again in my head, but it's getting easier to simply let go of the things that I cannot change. As Renee does in her posts, I wanted to share a couple of things that made me happy this week! Sleeping in with my dog until 10 a.m. I don't sleep in while I'm at school in Seattle, and get up around 8 almost every morning to work out before class. Since I've been home and haven't had anything to get done in a timely manner, I've been able to sleep in more, eat breakfast whenever, and go to the gym around midday. While I really enjoy getting up early and starting my day, it's nice to have a break from the structure! Plus, I don't get to have my dogs and cats in my bed while I'm at school of course, so it's been so nice to be able to cuddle with them all. Spending the day out in the sun with my family. It's been pretty rainy and gloomy for most of spring break, but there was a sunny day in the beginning of the week that my family and I spent outside doing some yard work and general straightening up! Days like these used to be tedious to me as a child, since it meant a whole day of chores, but now that I'm older I really enjoy them. It's so satisfying cleaning things up, and it was nice to spend the day with my parents because I don't see them as often anymore. Spending the whole day outside also meant I had a whole day to throw Willow's favorite toy over. And over. And over. Seriously, the dog does not get tired ever! Hanging out with my family who now lives close to us. Since my family moved a little while back, we found out we actually live about 15 minutes away from some of our family that I had never actually met! It's been really fun getting to know them and finding out all of our similarities. I grew up near part of my dad's side of the family, so it's nice to meet part of his other side! Being able to watch as many Harry Potter movies as I want. Being on spring break has meant that I have a lot of free time on my hand, so I've been spending a lot of it watching Harry Potter. I always tend to do this on breaks from school since it's something that reminds me of home, and because I'm just generally a huge Harry Potter fan. It also gives me that nice warm and fuzzy home feeling. My parents are saints, and tolerate these marathons, which is a plus. Those are just a couple of things that made me happy this week, and some things that definitely were the highlight of my week! These things don't always have to be huge and extravagent; they can be as little as wearing your favorite sweater and receiving a compliment. At the end of the day, it doesn't matter how big or small an event is - if it makes you happy, that is all that matters. "And while it is important to learn from your mistakes and unhappy events, it is unnecessary to focus on them incessantly. Learning from something and not being able to let it go are two different things - I've been there before, and let me tell you it is not healthy. Sometimes it's best to let things go when they are only making you stress out, and aren't offering you anything but negative side effects. It took me a long to understand this, and I still struggle with it. I still focus on things that didn't have the best outcome, and go over them again and again in my head, but it's getting easier to simply let go of the things that I cannot change." I'm not kidding, I read this paragraph over and over, like, four or five times. This is exactly what I needed to read right now. This post is so relatable, I tend to be so negative most of the time and think about incidents constantly. I've been loving the change too this spring break of being able to sleep and wake up whenever I want and go to the gym without having to worry about school related things! I'm glad this helped! :) And yeah I totally relate to that haha! I enjoyed actually making time to go out to dinner & put away my phone. It was a great getaway & not having my phone on me was helpful in keeping me focused on my friends.